Forget the Beast of Turin! This brutal Chistie front wheel drive racer is much more EXTREME! It is possibly the most exciting and elusive racing car ever. It not only is front wheel drive, but also has a huge and extraordinary transverse V-4 engine of almost 20 litres! It is as if it comes from another world, with its four large pots, riveted crankcase and big and short exhaust pipes, almost blowing their flames in the face of the driver. 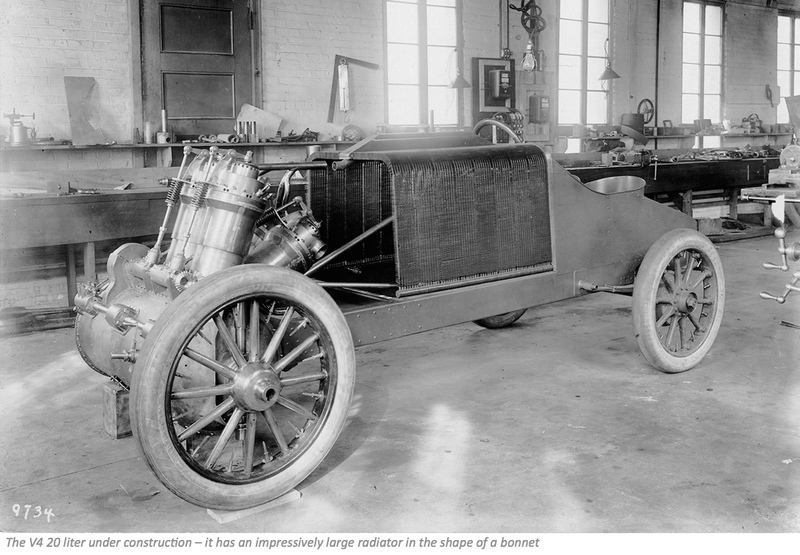 Late in 1903 John Walter Christie, an American mechanic, engineer and inventor, started designing extraordinary vehicles with the most unusual engines and transmissions. His point of view wasn’t as common as others. He aimed at designing a concept that pulled (like a train or carriage), instead of pushing (like a boat). That is how he came to front wheel drive. But he went a step further placing the engine transversely between the front wheels, just like Alec Issigonis did some 50 years later when he designed the Mini. 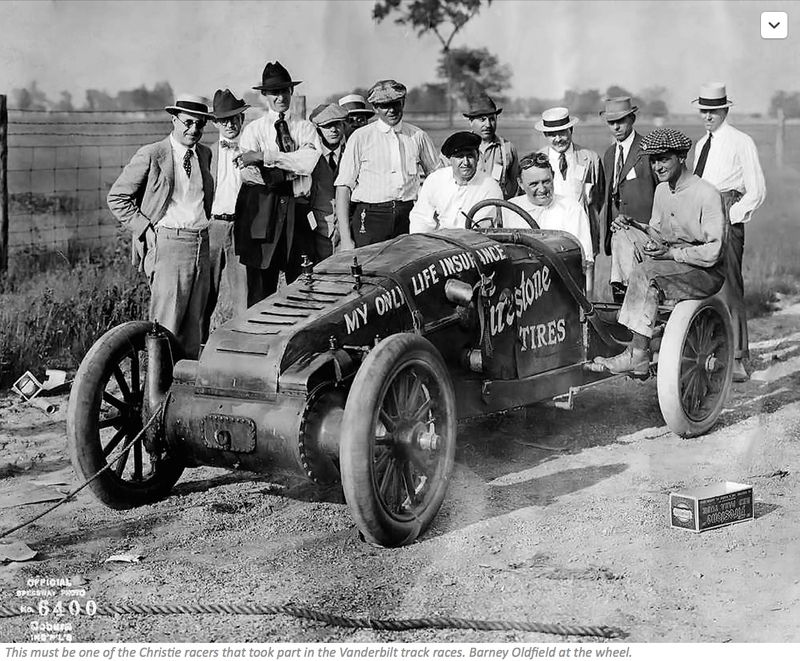 Christie was the first serious proponent of front wheel drive cars in the US. Walter Christie founded his Christie Direct Action Motor Car Company in 1905. Before designing those extreme vehicles he was involved with war-machinery, having established the Christie Iron Works in 1899. His Iron Works constructed, refurbished and strengthened gun turret components for US and British warships, which he did in a state-of-the-art machine shop in Manhattan, where he also was to build his high-tech racing cars. To put his front-wheel-drive concept to the test Christie entered his cars in track racing. The first racing car appeared on the race track in January of 1904. This way he hoped to promote his patented front wheel drive system, but the car wasn’t a great succes. His racer gained a reputation for heavy steering and challenging handling, the result of an extreme front weight bias. 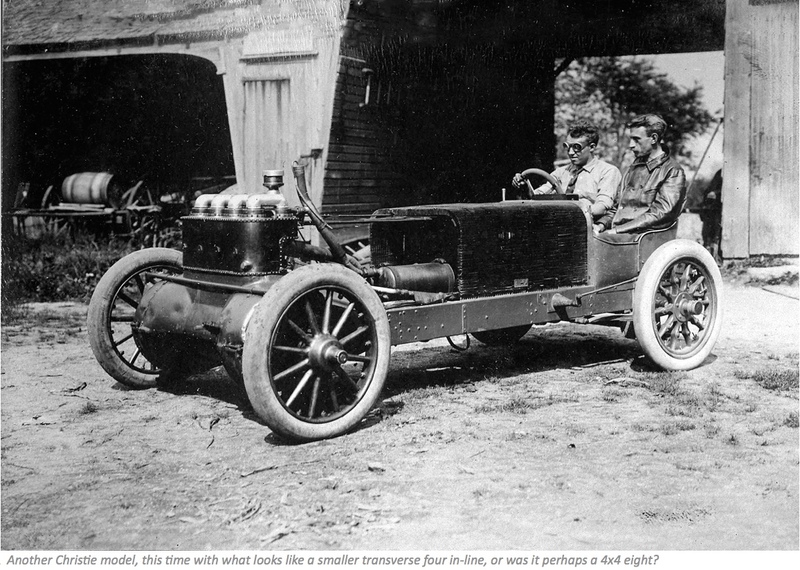 In the following years a total of six different racers were built, one of which had two 60hp engines, one at each end of the car! 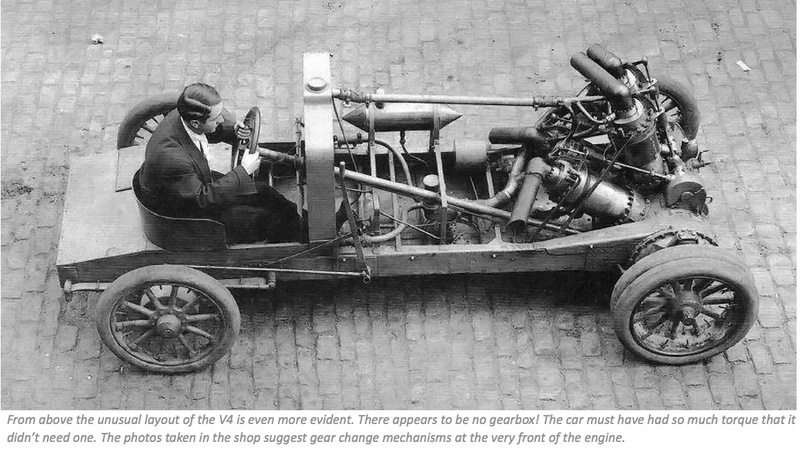 The most spectacular and brutal car Christie ever built was definitely the V-4 racer of 1907. It had an engine that housed an astonishing 20 liters (1,214 cubic inches), mounted transversely, the crankshaft taking the place of the front axle! 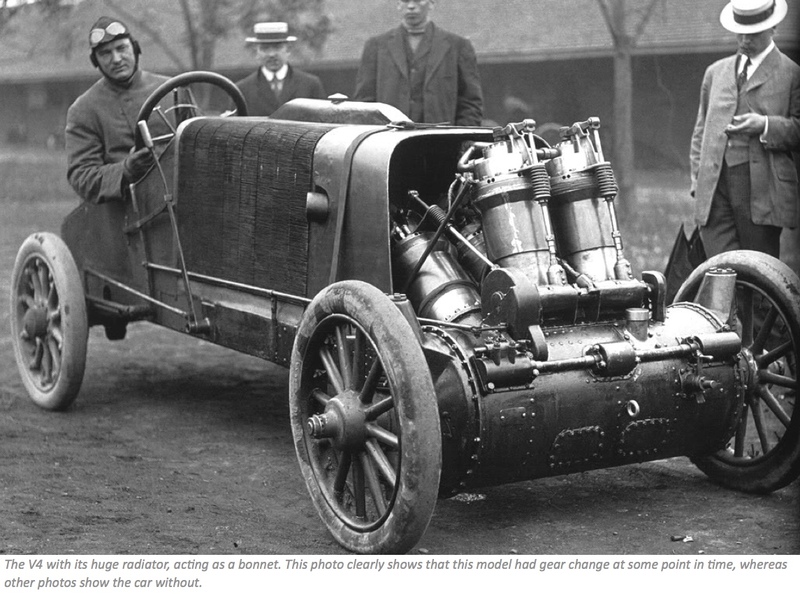 It was a completely new design, specially built for the 1907 racing season and using no parts from previous racers. 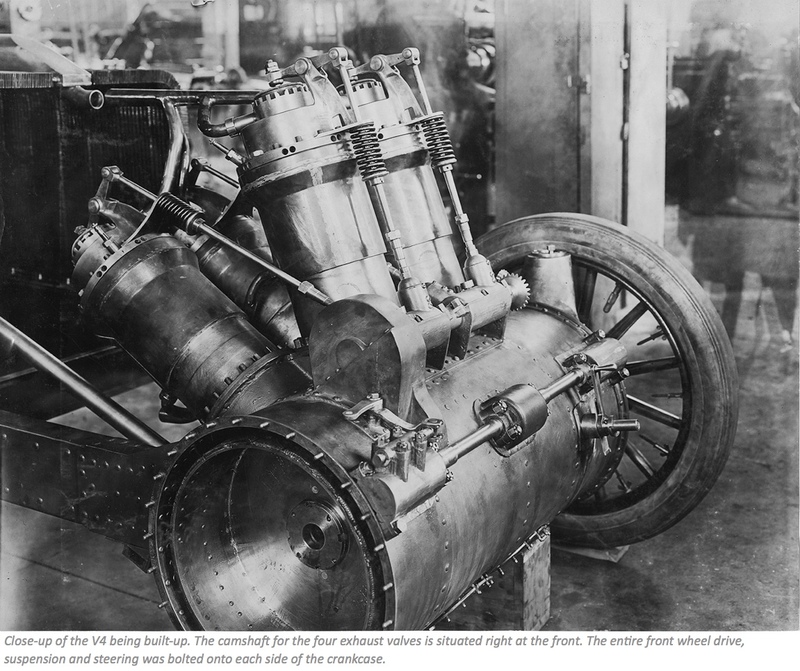 The immense engine had a bore and stroke of 184 x 184 mm (7 1/4 inch square) and 8 atmospheric inlet valves per cylinder and just one mechanically opened overhead exhaust valve. The transverse mounted engine employed crankshaft mounted spur gears and telescopic U-joints on each end to drive the front wheels, originally through a transmission arrangement that featured dangerously exposed gears. Later this was changed, to make it better suited for high-speed racing. After two poor performances at the Vanderbilt Cup races with earlier models Christie was determined to do better this season and he entered this car for the French Grand Prix of that year at Dieppe. The car did make it to the starting line in France, but unfortunately engine and/or clutch problems forced him out of the race on lap 4. 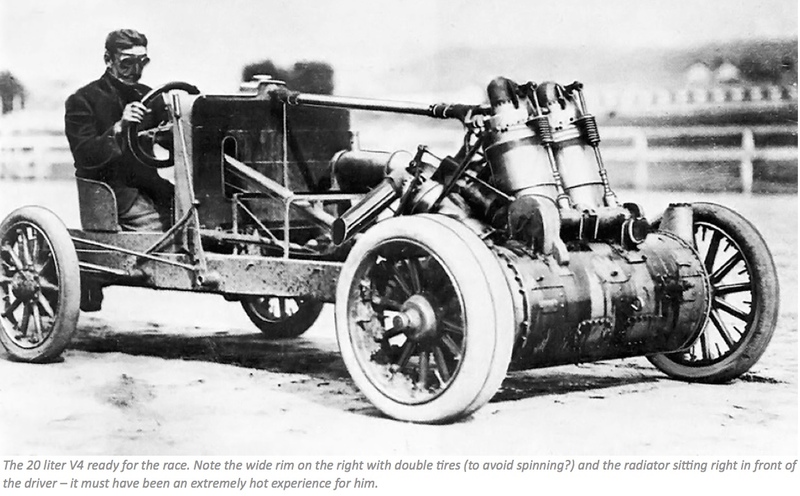 Walter Christie claimed to have reached a top speed of 120 MPH with this brutal machine. Despite its monstrous dimensions the Christie racer weighed only 1,800 pounds, which was not bad at all. Competing cars struggled to stay under the regulatory 2,200 pound weight limit. Walter Christie built two or three touring cars in 1905 and a later (1909) Christie vehicle was a taxicab with a 4-cylinder transverse engine. He ended his career making front wheel drive tractor conversions as well as tanks in his Front-Drive Motor Company, which gave him a reasonable amount of success. It appears that none of the Christie racing cars has survived, or could there be one still hiding somewhere? Front-wheel drive later became more successful, e.g. with Citroën that used it for its Traction Avant (which means literally front-wheel drive in French) as well as for the iconic 2CV. Citroën replaced the telescoping U-joints by Hookes type universal driveshaft joints, which were a drastic improvement and made the front-wheel drive system function properly. But there have been many other manufacturers who tried their hand at front-wheel drive, with more or less success. It seems Walter Christie at least achieved his goal to popularize front-wheel drive! 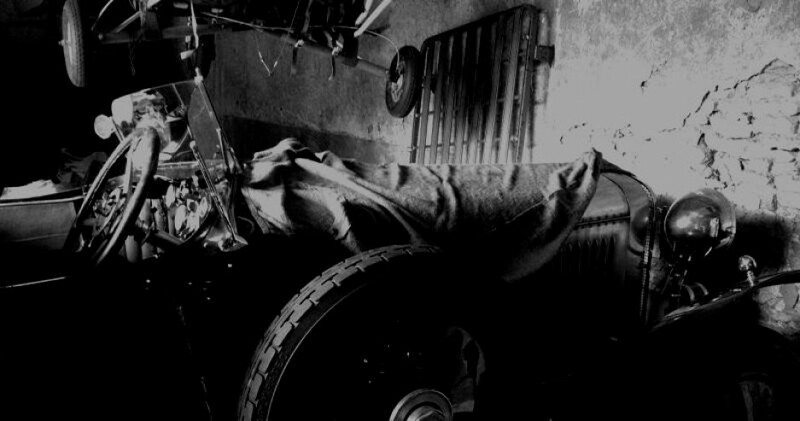 Great story about Walter Christie’s automobiles. None of his cars are known to exist. A reproduction maybe completed in a year or two. Stay tuned! During WWI Christi ran a service operation for the trucks that were driven across country before being shipped overseas. One of the mechanics was Ben F. Gregory, who claimed he learned front wheel drive principles from Christi. He would develop several FWD racers one with a Hisso aircraft engine and patented several variations. He took up aviation in the early ’20 and after a serious crash in the early ’40s worked as an aircraft inspector and during the ’50s designed a few personal cars and concluded by designing the Marine’s Mighty Mite 4-wheel Jeep type built by the new AMC auto company. His daughter had a photo with him in a crowd surrounding one of Christi’s cars.